Volleyball Terms - What Do These Terms For Volleyball Mean? Various volleyball terms are thrown around between players, coaches, referees and people who enjoy the sport. Many of these names are very creative and funny. Scroll down to get in on some of the lingo. Campfire: When a ball falls to the floor between either a couple or a few players and they are caught just looking at it as if they were circled staring at a campfire. Volleyball Lingo: Is this "Jungle Ball"? Tuna or Fish: This is what a player is called when they get caught in the net. Jungle Ball: A volleyball game in which the people participating don't really know how to play volleyball. Vegas Line: Named after Sean Rosenthal, an American beach volleyball player, when he delivered a powerful kill with a hard-line spike penetrating his opponent's line block. He was in Vegas during this spectacular spike. Kong Block: A one-handed block that resembles the movement of King Kong on the biplanes. Chowder: A messy double contact on a hand set. Prince/ Princess of Whales: A player who spikes the ball as hard as possible regardless of anyone or anything around them. Sizzle the Pits: A hard spike that passes under the blocker's earnest arms just grazing their arm pits. Bringing the Heat: A tremendously hard spike! Here Comes the Heater: This one liner may be called out among players when an especially hard server is getting ready to serve. Friendly Fire: When an unsuspecting player gets hit in the head by a teammate's serve. Husband and Wife Play: When a ball drops between two players, untouched by either of them. Oops! Redwood: A name given to a blocker who is tall but not especially quick on their feet. Mintonette: The original name given to the game we now call Volleyball. Nectar: A perfect and sweet set. Paintbrush: When a hitter swings but then barely touches the bottom of the ball, dropping it over the opposing blocker. Lollipop: A lollipop is an easy serve that flies high into the sky and over the net. It is not the most sophisticated serve. Volleyball Lingo: "That's a Lollipop!" Chester: When a player is hit hard in the chest by a serve or spike. Ouch! Coach Kill: When an opponent serves the ball into the net or out of the court just after there was a substitution or a time out. Deep Dish: A very soft set where the ball rests in a players hands for a bit too long. Pepper: A drill where two players partner to warm up by passing, setting and hitting the ball back and forth. Rainbow: A soft shot over the blockers with an arc that resembles a rainbow. 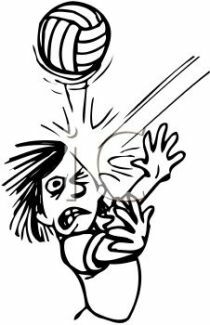 Six Pack: Sometimes known as facial, this term is used when a blocker gets hit in the head or the face by a spiked ball. Bump: When the ball hits the forearms and is passed on. Spike: A ball hit with force by an offensive player trying to hit so that the defense cannot recover the ball. Dig: When a player passes a strongly spiked ball that is close to the floor. Ace: An outstanding serve which is not passable by the opposing team and results in a point for the serving team. Kill: An attack that earns the offensive team an immediate point. Block: When one, two or three players jump in front of the opposing spiker with their arms raised to prevent the ball from coming over to their side of the court. Assist: This is when a player sets up a teammate with a pass, set or dig so that the teammate can spike the ball and earn a point for the team. Free Ball: An easy ball for the opposing team to play. 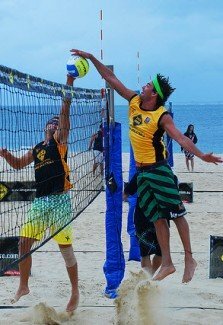 Joust: When two players from opposite teams meet above the net to contact the ball. Shank: A bad pass that flies into the audience or anywhere that it is not supposed to. Side-Out: When the receiving team earns the right to serve after winning a rally. Strong Side: When a left handed hitter is hitting from the right front position or when a right handed hitter is hitting from the left front position. Cut Shot: When a ball travels at a very sharp angle across the net from a spike at the hitter's strong side. Dink: A push of the ball around or over the blocker. This is totally legal. Volleyball Lingo: "Have the been overlapping?" Overlap: This term refers to the positions of the players before contact with the ball while serving. Forearm Pass: When a player bumps the ball with the fleshy part of their forearms. Key: To predict a team's next play by watching how they have played so far. Overhand Pass: A pass that is controlled by the fingers and thumbs with both hands open taking place just above the forehead. Doubles: A game with four players involved, two on each side. We see this mostly played outdoors, on the sand or grass. Rotation: The movement of the players clockwise around the court and through the serving position. Tagged: A player gets tagged when they cannot move fast enough out of the way of a hard hit ball. Volleyball Lingo: "Tagged, Facial or Six Pack"
Approach: A fast run toward the net before he jumps into the air to spike the ball. Beach Dig: Also called a "deep dish" this is when the ball is received with open hands. Dump: When an opponent uses a soft hit by the net instead of a spike so as to throw off the other team. Power Alley: A cross court spike that reaches the farthest end of the court. To read more common volleyball terms - or more terms in hitting and defense, check the other sections below. Volleyball Hitting Terms-Offensive Terminology Volleyball Offense Terms. What is thirty-two? Slide? Tandem? Volleyball Defense Terms - Defensive Terminology Volleyball Defense Terms. What is a gator? Flipper? Volleyball Terminology - Common Terms in Volleyball Common Volleyball Terminology. Learn some basic setting and serving terms.